It seems Marvel's on a bit of a female superhero kick recently, what with the new Thor making an impressive mark, but it gets even better with a new one-off Spider-Man comic that's set in an alternate universe where Gwen Stacy is bitten by Radioactive spider instead of Peter Parker - and gets a way cooler outfit. The One-Shot comic is the second issue of the Edge of Spider-Verse miniseries that's currently running as a prelude to the Spider-Verse event planned for Spider-Man comics later this year, which will feature a host of Spider-men (and women) join together to face the multi-dimensional threat of Morlun. 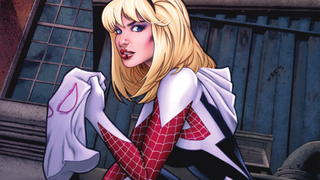 Each issue of the series focuses on one of these alternate Spideys - including this one, where Spider-Man is in fact Spider-Woman Gwen Stacy, who balances her life as a crimefighting superhero with hiding secrets from her Police Chief father, and her boyfriend Peter Parker. Oh, and she's in a band with Mary Jane Watson called The Mary Janes. That's pretty cool. Edge of Spider-Verse #2 is due in Comic Book stores next week, on September 17th.